Blue Lace Agate is a variety of banded Chalcedony, a mineral of the Quartz family. Agate sparked a world renowned stonecutting and polishing industry in German. It flourished from the 15th to the 19th Century, and exists today. 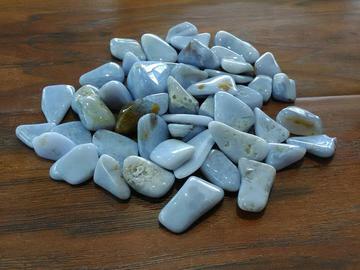 Blue Lace Agate is great for activating and healing the Throat Chakra and for balancing the brain. This stone enhances verbal communication and expression.